​AME CET previous question papers are revision purpose and helpful in attaining good All In Rank (AIR). There are total 90 questions. Each question carries 4 marks and 1 mark will be deducted for every wrong answer. The exam can be in Hindi and English medium. The subject varies from the qualification of the candidate. The questions are from general awareness, English, physics, chemistry and aptitude. 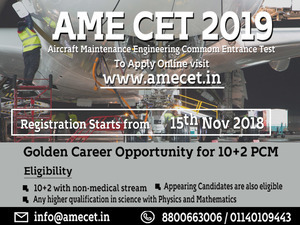 For more info visit www.amecet.in or contact us 8800663006.